The Greater Toronto Area is notorious for motor vehicle accidents. The ever-growing surge of daily business commuters, the seemingly never-ending road construction projects, and the months of hazardous winter weather create a formidable mix of exasperated, impatient, and aggressive drivers, causing the number of car accidents to rise year after year in Mississauga and the greater Toronto area. If damages to vehicles and the hassle of dealing with insurance companies and expensive car repair shops weren't enough, these accidents often result in personal injuries, and battling through legal processes to receive one’s deserved compensation can be a nightmare. It’s easy to believe the driving conditions in the Mississauga area are what the phrase “add insult to injury” was coined for. Personal injury pertains to harm done to one’s physical body or psychological state as the result of an accident. Car accidents in particular can be extremely traumatic events, even when physical injuries are minimal. It is not uncommon for victims of car accidents to find their mental and emotional wellness so altered from the experience that it affects their ability to return to work or to continue interpersonal relationships in the same way. The emotional and financial effects of a car accident often extend to victims’ family members as well, particularly when physical or psychological damage is so severe that the injured persons can no longer take care of themselves. In such cases, access to a highly competent personal injury lawyer who will fight for deserved compensation is paramount. A 38-year-old man was hospitalized with life-threatening injuries after being struck by a car when disembarking from a MiWay Transit bus in Mississauga. Three vehicles on the QEW in Mississauga were involved in a crash in which two drivers and an OPP officer sustained minor injuries when a 22-year-old Toronto male exhibited fast and aggressive driving. A 14-year-old girl was admitted to the Toronto trauma center with serious injuries after being hit by a car in Meadowvale. A $2.2 million civil lawsuit was launched against York Region Police for the death of a teenage girl who was struck by an unmarked police vehicle. An elderly Mississauga man made an improper turn into oncoming traffic, resulting in a fatal crash that took his life and seriously injured his wife. The driver of the other car sustained minor injuries. A middle-aged couple suffered physical and psychological effects that rendered them unable to return to work and forced them to sell their house following a crash with a negligent driver who ran a red light. The lawyers at Injury Lawyers of Ontario (ILO) are very familiar with the challenges and suffering of traffic accident victims in Mississauga. The ILO group works with only the most expert and experienced personal injury professionals to help injured persons receive the compensation they deserve so that they may return to their normal lives as quickly as possible. 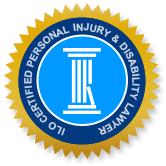 ILO also specializes in personal injury due to slips and falls, recreational accidents, long-term disability, and animal related injuries. As well as law expertise, ILO has connections with many medical professionals whose input we use to understand the scope of your injuries and the needed long term care for both physical and emotional trauma. We understand that accidents can be life changing and legal processes are often overwhelming. As such, we treat our clients as we would family and relieve them of the burden of legal formalities and lengthy applications, while keeping you, the client, abreast of the development of your claim. Our aim is to deliver not only the monetary compensation you deserve but also provide an experience that is as respectful, stress-free, and rewarding as possible. We urge those who have been injured in a car accident, whether physically or psychologically, to contact our Mississauga office in person, via phone, or with our confidential online form.